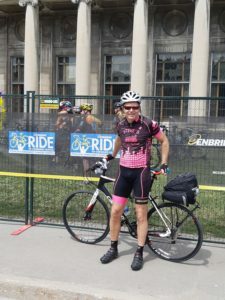 HSH Founding Partner James Howie is participating in the Enbridge Ride again this year, the 12th anniversary of the ride. The Ride is 220-kilometre cycling journey through the Canadian countryside, this year held on June 8th and 9th. The ride raised $18.33 million last year and $212 million dollars in total over the past 12 years. The point, of course, is to honour those who have had the misfortune to have had cancer come in to their lives, and to honour their courageous struggles. In particular, Jim rides to honour three people: his assistant for 30 years, Anna, who has had her struggle with cancer result in successful remission, his partner’s mother who passed away in 2014 from cancer, and his father, who has several forms of cancer currently being treated. Jim’s goal in his donation campaign this year is to raise $15, 000. Support Jim by visiting his personal donation page!